This book covers all different options available for CRM reporting and provides good grounding in CRM reporting aspects so any users/developers want to learn/understand CRM reporting better this is book for them. The first chapter explain different types of reports available in CRM and also explains installation procedure for CRM 2011 connects and Reporting authoring extension. SQL reporting service version sections (page 15) explains different SQL server version compatibility with SQL Server and CRM server and states that SQL Server 2012 is not compatible with Visual studio 2012 for CRM 2011 Reports. I guess this was correct at time of book writing but since then Microsoft released update of SQL Server Data tools and after this update Visual studio 2012 can also be used to develop CRM reports for SQL Server 2012. This chapter explain basic and advanced commands of SQL Language and also FetchXML Language. All the dynamics CRM views are created with this FetchXML language and users can now write reports in CRM 2011 using this language as well. This chapter takes you through step by step guide on how to create report in CRM using CRM reporting wizard and then how to modify that report in SQL Reporting Service Project. This chapter explains step by step guide to create report using SQL Report Builder which comes with SQL Reporting services. SQL Report Builder can be used by intermediate user to develop CRM reports. This chapter looks at advanced tools (visual studio) to create CRM report and this chapter also reviews CRM report parameters and chart controls. This chapter looks ate crating embed report on CRM entity form. It creates HTML web resource to achieve this functionally and chapter also explains how to create/update this HTML web resource. This chapter explains process of integrating report in CRM dashboard and CRM charts (i.e. new feature in CRM 2011) basics. This chapter looks at how one can troubleshoot different issue arising while working with reports in CRM 2011. Quick rightly these details were need as user will tend to hit these issues while developing CRM 2011 report. This chapter also focuses on performance enhancement and SQL Reporting Service Best practices. This chapter explores CRM reports on different mobile devise like iPhone, iPod and Microsoft Surface and also explains process of configuring IFD authentication with CRM. This section explores basic expression and their usage in reports and how can you add external code, variable and assemblies in report. Provided that we already have Dynamics CRM books but I guess each book generally dedicates chapter or two for CRM reporting only while this book is specifically for CRM reporting which is really good. And although this does not cover all types of reports (i.e. matrix reports, SQL advanced chart type reports) related to CRM it does cover lots of details related to CRM report So if you are just started work in CRM reports or working in CRM reports but want to know more about it this is definitely book for this. If you are interested in buying above book, here is link for this. 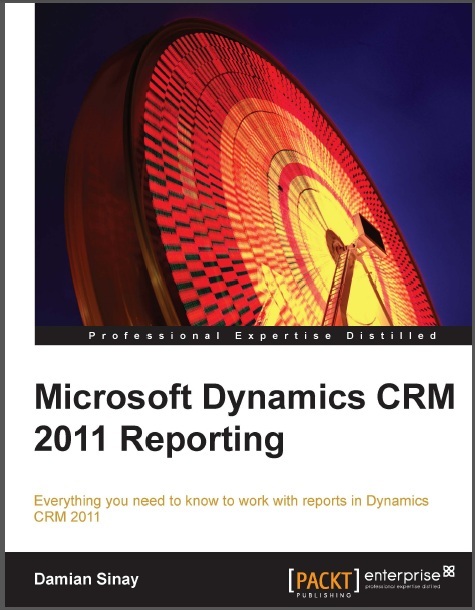 This entry was posted in Books, CRM 2011, CRM 4.0, Reporting on July 19, 2013 by mayankp. Above code does not work in CRM 2011 and by doing really simple change as mentioned below, so following code works fine for CRM 2011.. Note: This is unsupported customization, Please unit test this module on your development/test environment before applying it to Live Environment. This entry was posted in CRM 2011, CRM 4.0 and tagged CRM 2011, Java Script, Unsupported on March 21, 2012 by mayankp.